Audi unveiled the new generation Q5 at the Paris Motor Show on Thursday. This redesigned SUV will make it to the Indian market as well, but sometime next year. The 2017 Audi Q7 is lighter, more dynamic and more fuel-efficient than its predecessor. Reasonably, when it goes on sale, it will replace the current-gen model. Also in comparison, the new Q5’s grille and sculpted lines look more masculine. The vehicle’s overall design is inspired by the larger Q7. Also, the adoption of VW Group’s MLB platform, which underpins the A4 and Q7, has helped the Q5 shed 90kg of weight. Equipped with LED or high-resolution Matrix LED headlamps? Yes, that’s a given! Inside the cabin, the interior looks familiar as it is laid out in typical Audi style. There is a driving mode selector which lets one change a number of dynamic settings. On the other hand, there is a display screen mounted on the dash for the infotainment needs and a part of the MMI system with rotary and touch controls. Coming to the electronic driving aids, the carmaker has equipped the SUV with adaptive cruise control, blind spot monitoring and even lane keep assist. Most of this tech is again borrowed from its Q7 sibling. This Audi Q5 will be powered by a 2.0-litre turbocharged inline-four mill. This unit churns out around 255bhp and 370Nm of torque, showing a bump in power as compared to the outgoing model. The new engine setup comes paired to a seven-speed dual-clutch transmission. 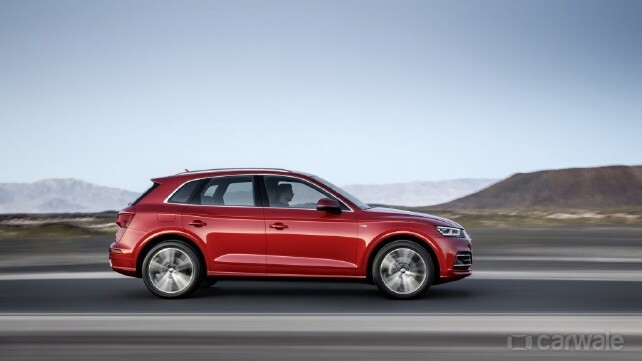 Audi will put the Q5 on sale in the Europe shortly after this Paris debut. While sales are expected to begin in April 2017 in the US, the Mercedes-Benz GLC and BMW X3 competitor will only be launched in India by mid-2017 then.